The department (Bihar State Co-Operative marketing Union Limited) has officially released the Notification regarding the Biscomaun MTS Officer and Various Posts Recruitment 2019. Released recruitment is to fill up the MTS, Officer & Manager and Various posts. Desired candidates can apply for the same. The registration for the Biscomaun MTS Officer and Various Posts Recruitment 2019 have going on by 7 February 2019 to 22 February 2019. Candidates can check the Biscomaun Various Posts Official Notification 2019 to claim their eligibility. All information regarding the Biscomaun MTS Officer and Various Posts Recruitment 2019 is available on the official website i.e. www.biscomaun.hiring.org.in. Else they can check it on this article as well. Candidates are advised to apply for Biscomaun MTS Officer and Various Posts Recruitment 2019 before the last date i.e. 22 February 2019. The authority will not be going to accept any application after the due date. Applications for Biscomaun MTS Officer and Various Posts Recruitment 2019 has started on 7 February 2019. Candidates need to visit the official website to check all the information regarding the declared recruitment. After register in Biscomaun MTS Officer and Various Posts Online Application, the candidate needs to appear in the written examination to qualify in the recruitment procedure. 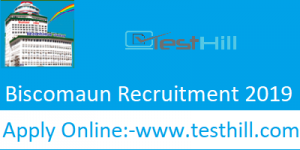 Interested candidates have to download the Admit Card for this recruitment before the examination. We will provide direct download links for all the visitors.